OKLAHOMA CITY (AP) -- The president of the International Softball Federation says the re-introduction of the sport to the Olympics would add value to the games and provide opportunities for young women around the world to pursue their athletic dreams. Attending the World Cup of Softball, Don Porter spoke with The Associated Press less than two months before the International Olympic Committee will consider a combined bid by softball and baseball to return to the games. The combined baseball/softball bid is competing with bids from wrestling and squash to be included on the program for the 2020 Olympics. The IOC will vote on the bids during its meeting in Buenos Aires, Argentina, on Sept. 8. Porter initially resisted the idea of combining softball's bid for Olympic reinstatement with that of baseball, but changed his mind after speaking with IOC members who suggested doing so would be a good idea. Thus the World Baseball Softball Confederation was born. The softball/baseball campaign is political, but Porter said the WBSC is trying to focus on the positives of including their sports on the Olympic program. Porter said the two federations have about 130 member nations between them. Softball's image for years, fair or not, was that it was a sport dominated by the U.S. That's not the case, Porter said, noting that softball has made considerable inroads in South America and Asia, and that it's also taken root in some predominantly Muslim nations, where the sport doesn't clash with their culture. Softball's 2014 World Championships will be held in The Netherlands, taking one of the sport's marquee events to Europe, where it has struggled to gain acceptance. "Europe is very important, especially from the Olympic standpoint, because Europe has the majority of votes within the International Olympic Committee. We want to, and certainly have been, encourage greater development in Europe. That's why we felt having the World Championship there was important." The IOC received considerable backlash when it opted to drop wrestling from the Olympic program and Porter acknowledges that makes the softball/baseball campaign more challenging. "Wrestling is a great sport," he said. "It was one of the original Olympic sports. It was unfortunate what happened, but they've been given an opportunity to come back, like we have. It probably is going to be more difficult (for softball/baseball) because there is a lot of sympathy for wrestling, for a lot of reasons. "But we hope to be able, in our campaign, to get a message across that we feel is very positive as to what we can add to the Olympic program and hopefully get the vote in September." Photo : (AP=Kyodo）Japanese Women’s Softball won the World Cup in Oklahoma City, USA on July 14 by 6-3 against USA, for the first time since 2005. 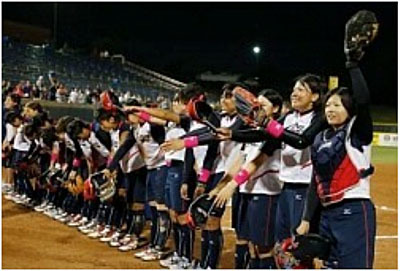 The Japanese team won the Women’s World Softball Championship July 2012.